ETSy, Embroidery and Ever so much to tell you! With that back to school feeling hanging in the air, it seems the perfect time for new ventures. I have to say though, starting your own small business in the creative genre, on your own, in this mega techy world, is not easy. You have to think of the idea, do the design, make it, write the pattern and be sure it is comprehensive, find out how to get it to the market place and source the supplies and then when you get there, it is just a sea of choices, a minefield of technology and a zillion competitors. It has taken me time to wander along this path. I have spent hours and hours learning how to do computer graphics and discovered that it is not easy to develop a new idea from the design wall, to the sewing table to the finished product, then back again to the design wall and the computer to try to put it into pattern format and then back to the sewing table and finally back to the computer. It has been a massive learning curve and although it has been fun, it has also been really hard work. Anyhow, I am so happy to tell you that I now have a little Etsy shop 'Ruby Seppings Designs'. You can find my quilt patterns, some fabric bundles and my new digital embroidery patterns. I love embroidery and am always championing its cause in the modern world. It is not as difficult as people think and it can add beautiful touches to handmade items that really make a difference. You also don't need alot of expensive equipment, just a hoop and a piece of fabric and a few coloured threads and a needle. I also love quilting and combining fabric with embroidery and I wanted to design something that had all of these elements. A few months ago, I saw an image in a magazine of a lovely chair, up against a bookcase and I thought that perhaps it might work as an embroidered picture. I traced the outline of the chair and started stitching my idea. It turned out way better than I could ever have imagined and sparked the idea of finding other chairs that I could stitch. When we went on holiday to Scotland earlier in the year, in our hotel room was the most gorgeous red velvet Chaise Longue and despite the fact that I couldn't take it home - I used the idea for the second chair. Adding the little quilt, just gave it that fun and more modern touch and I have to say that I think this is my favourite! I wanted to make two more designs to complete the set and I thought about what to do. I wanted to make one design that was a bit simpler and perhaps less intimidating for a beginner, so I turned to the sort of chair and scene that would make me happy any day of the week. This was my first attempt at the design and it was rather cute, but somehow, needed a strong surround to bring out the idea. I made it into a cushion. However, I needed to make it fit with the other designs, so I started again on a coloured fabric and this time, filled in the arm chair. I was just thrilled with it and I saw that the little collection was coming together. I was wondering what to do for the last design and then we were at the Garden Centre one day and I saw a swinging pod chair - that was it. I wish I could have brought the chair home, but guess I will have to settle for my little stitched version instead. This was super fun to do and really complimented the other patterns. It was quite quick to stitch too and so my quartet was complete. Then the fun started. How to get my drawings into some sort of format that could be used as a pattern. I didn't really know where to start. I googled, read, asked around and knew that I needed some sort of graphics package for the computer. I asked a couple of the graphics design students that work at the arts centre, where I go to do my pottery classes and they suggested the top dogs, Publisher and Photoshop. They showed me how you can scan in a drawing and use the tools to make a printed design. It was just sooooo cool, but both these packages are very expensive. I looked around the market place and decided instead to buy 'Affinity Designer' - a less expensive option for Mac, which seemed to have all the functions that I would need. It has turned out to be absolutely brilliant... but.... it has taken me alot of time to learn how to do this and produce, professional patterns. The thing is... you just have to be brave and try and this is the beauty of computers - you can press buttons and wander around your keyboard, seeing what everything does and eventually it all falls into place. So I finally have four patterns, complete with tracing and stitching diagrams and they are all available in my Etsy shop to download. Can I just say too, that these little patterns are not so difficult really. 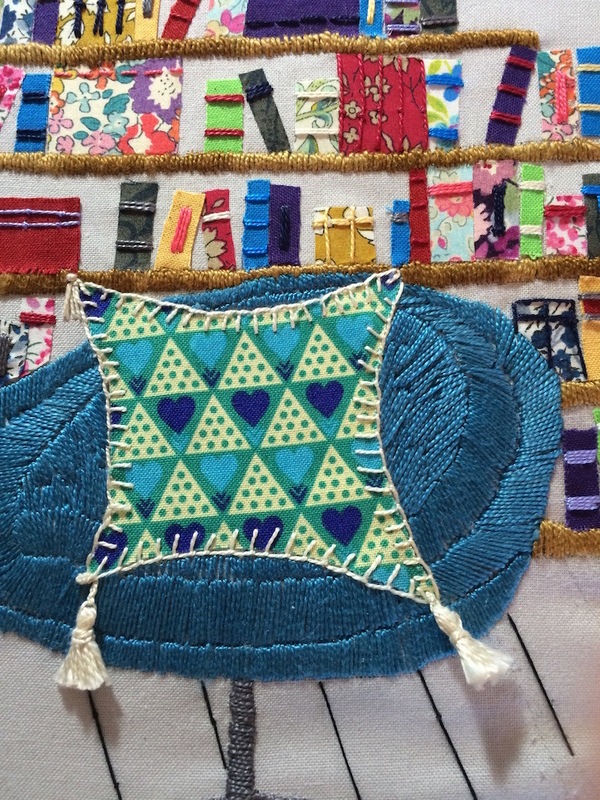 The appliqués are fixed on with fusible web and held in place by coloured stitching. I hope you like them and that they are something a bit different for anyone who loves stitching as I do. 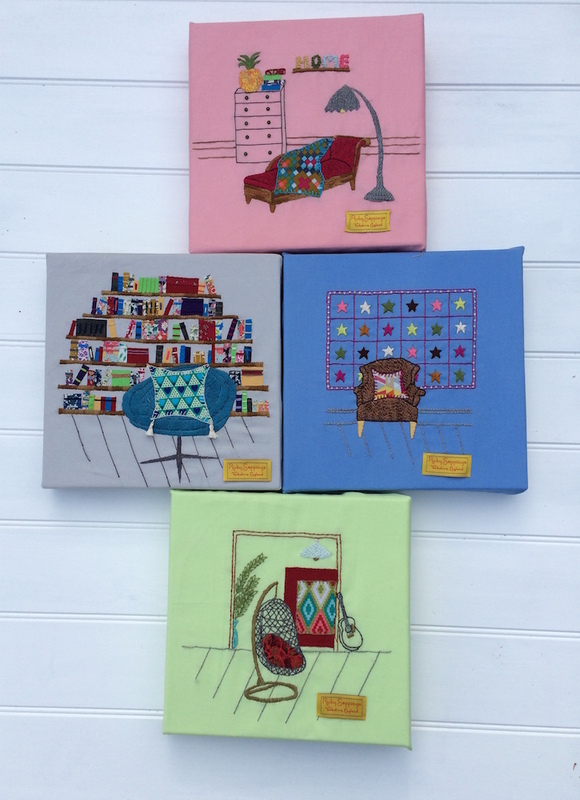 To finish off, I mounted each of them on to 10" canvas and I think my embroidered tiles are a little bit of creative whimsy, to brighten up any wall. You can also find a few fat quarter bundles for craft projects in the Etsy shop. I know how frustrating it can be when you can't get hold of small pieces of fabric in the UK and it seems like shipping them from abroad is expensive and time consuming. I am particularly excited to be able to offer some Moda Crossweave fabric, which I absolutely love for embroidery, bag making and quilting. The colours are just delicious and go so well with whatever printed fabrics you might have to hand. I hope soon to have some other interesting fabrics including Wool and faux leather. Finally, I plan that these embroideries will also be available as kits soon. Ruby has her own little boxes now and just as soon as I can source everything that is needed - they will be up in the website and on Etsy soon. So my design wall is empty now...after months of staring at these little chairs...what will be next up there? Oh, I have plans... as always! Click 'here' to go to the Etsy Shop or on the badge at the top right of the blog.